Tomorrow’s Thanksgiving! Thanksgiving is one of the (sadly probably few) things about my American heritage of which I am truly and deeply proud. To have not only a day, but a four-day weekend in which people are expected to spend time with other people who are dear to them, set apart to give THANKS… well, I just have the utmost respect for the brilliance of those early Pilgrims who came up with this idea and the Founding Fathers of the USA who preserved it as a national holiday. So I’m pleased the blogosphere slows down this week. It’s for a good reason. 1- Violence has picked up in Eastern Congo, a region which has certainly seen enough of war to satisfy many generations. I found this news analysis particularly helpful for understanding the dynamics of a region we often prefer not to think about. 2- War in Gaza is back in full-swing. The stories coming from there are heartbreaking, even more so for the dèja vu feel we all get when we read them. This article put a particularly human side on that story – yes, lest we forget that this is about people’s lives! 3- No Women Bishops in the Anglican church for the foreseeable future. Many of my friends are disappointed and deeply opposed to the decision. I confess I am not. Theologically and spiritually, I can see both sides. But this blog post seemed to give a very helpful reason why maybe now was not the time. Are these hopeful links for Thanksgiving? Perhaps not, but before I start baking massive quantities of turkey, pie, potatoes and corn, I need to remind myself just how very much I have to be thankful for, even that I get to indulge in a food fest in the first place! Now let me share some of where I’ve found hope this past week… Poetry is the art of the spoken word. Especially in Arabic tradition, poetry was made to be recited not read, and the truth held in poetry is as much through the telling as through the words spoken. In this spirit, I share with you a video of a poem. Though it’s about Gaza, I think somewhere in the deep heart it captures why all of the world’s events are, at the end of the day, hopeful. This is not sadness or despair, this is hope at its purest! And finally, I hope you’ve stuck with me this long, because I’ve saved the best for last. 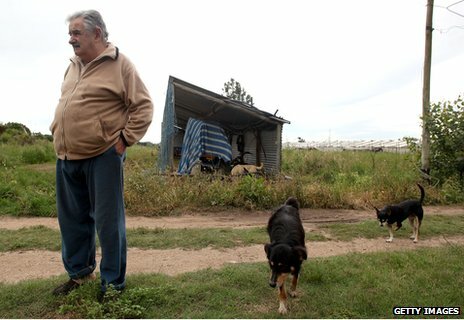 This gentleman is my new hero: the president of Uruguay and he lives the life of a humble farmer. He gives most of his income away, lives in his wife’s house and spends his free time gardening (it does make me wonder where he finds time to govern, but that’s not the point!) Click the photo to read the story! This entry was posted in monday mining links and tagged Congo, gaza, Goma, Thanksgiving, Uruguay, women bishops. Bookmark the permalink.